UK supermarket chain Sainsbury’s has released arguably the best Christmas ad of the year, however, it’s infuriated the retailer’s staff who argue they’re forced to work long hours and don’t get to see their families – the premise behind the ad. The ad plays on the tradition of animated Christmas cartoons and is all set to a delightful little jingle. It follows family-man Dave who, coincidentally, works in a toy factory. However, Dave’s so busy in the lead up to Christmas, he feels he’s neglecting his family and so he decides to clone himself. The clones do all the work and Dave does Christmas with the kids. 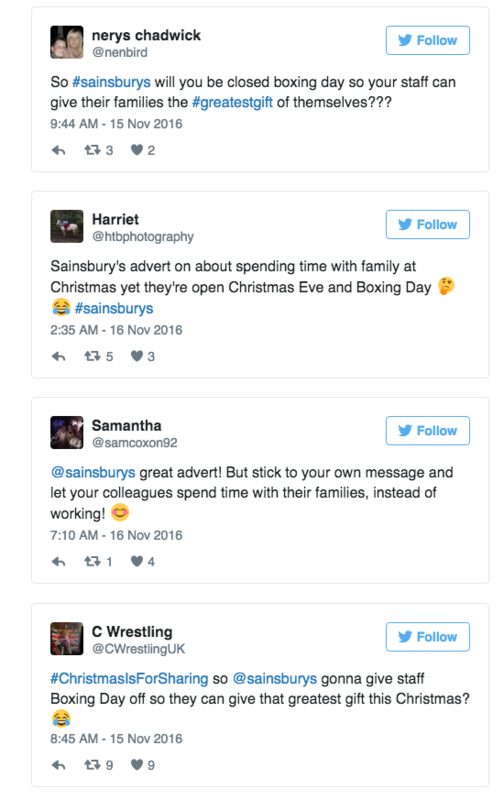 All nice enough, but now Sainsbury’s employees and their families are complaining the ad smacks of hypocrisy as they’re forced to work long hours over the festive period, including Christmas Eve and Boxing Day. And the complaints could not be more timely, with a recent petition in the UK – that’s garnered over 200,000 signatures – calling on Parliament to ban Boxing Day trading so retail workers can spend more time with their loved ones. A spokesperson for Sainsbury’s told the UK’s Metro.co.uk: “We’re really proud that at Christmas we will do a great job of serving our customers wherever and whenever they want us to. “This is at the heart of what we are about as a big retailer, particularly at the busiest time of year when our customers rely on us to help them celebrate with everything they need.